Despite stocks finishing lower yesterday, all of the major US index ETFs have held onto their overbought levels and are looking to finish the week there. The greatest strength continues to come from small to mid-caps. Whereas recently mid-caps have done slightly better, this week’s price action has led small-caps to take the throne. The Micro-Cap ETF (IWC) has been the best of these ETFs headed into the end of the week rallying 2.86%. Other small-caps, the Core S&P Small Cap (IJR) and Russell 2000 (IWM) are not far behind these kinds of gains at 2.77% and 2.73% WoW, respectively. As we have repeatedly highlighted, large caps have continued to lag. In the last week, the Dow (DIA) and S&P 100 (OEF) have both ‘only’ gained 1.29% and 1.26%, respectively. Still, these are not losses so things are not that bad. 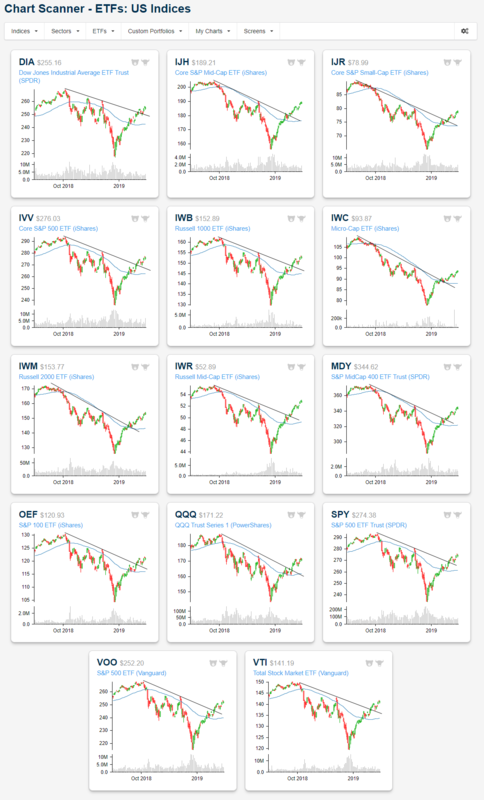 Granted, despite an impressive rally this year with each ETF hovering around a 10% or greater gain year-to-date, not a single member of this group has broken out of their downtrends (on a six-month time frame). While progress has been made in changing that, it will likely take a bit more time and work on the part of the bulls to see trends begin to change through our Trend Analyzer. These trends are evident in the charts. 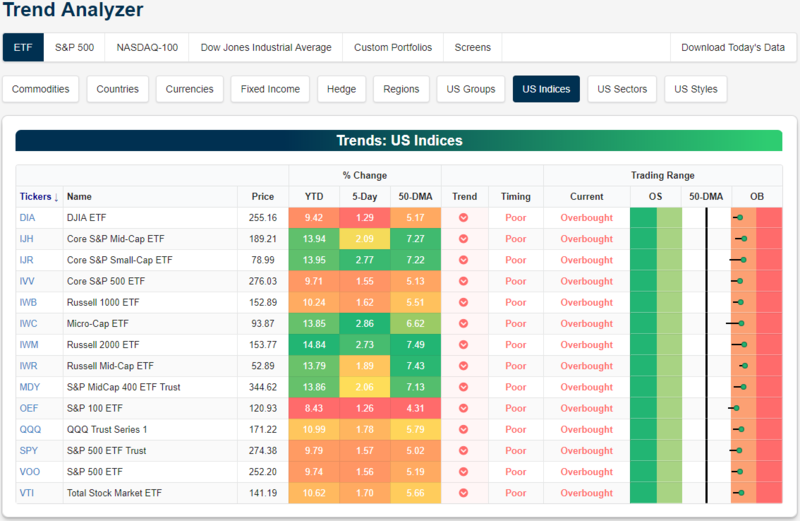 Shown below is a snapshot of the above ETFs in our Chart Scanner tool. Obviously, prices are trending down and to the right still, but price action has also more than broken out from the downtrend lines so these trends have very much had some positive developments. At the current overbought levels, there is likely to be some type of pullback that could restest these downtrend lines.